I have these tiny beetles in my CAR. I have been freaking out and trying to figure out what they are, where they came from and how to get rid of them! We have cleaned the car, vacuumed ourselves, Professionally cleaned the car, sprayed with essential oils insect repellent and they KEEP COMING BACK. We haven’t seen them flying though so we aren’t sure they are in fact cigarette beetles. Do they really bite??? If they are in fact cigarette beetles how do we keep them from getting in the house?? I called Orkin who said to get the car steam cleaned. Please. What will get rid of them once and for all? At this point you’ve made no mention of treating with a good insecticide. That being said, its important to use the right one. For this job, PHANTOM is the way to go. Its odorless and non-repellent which is important. As a non repellent, it won’t spook them. This way when they walk over the treatment, they’ll pick up a lethal dose and bring it back to their nest where it will be shared. Within 4-8 days of treating, most if not all of the active insects will be dead no matter what they might be or where they might be hiding. Here’s why. First, Phantom will work on any insect so there is no need to know if they CIGARETTE BEETLES, CARPET BEETLES, GROUND BEETLES or something else. Bottom line is it doesn’t matter. Second, since its non-repelling, insects won’t detect it. This means they’ll readily walk over the treatment and when they do, they’ll pick up a small amount of the chemical. Phantom doesn’t kill them quickly so it will take 2-3 days for it to work. But this is by design so if they get close to other insects, they’ll effectively share it and in turn, kill several even if just one picks up the active. Most every other “common” spray would be detectable and once insects know something is around, they’ll avoid it so the problem would go on and on and never end unless you somehow figure out where they’re nesting. But in this case, using Phantom will override this need so you won’t have to worry. Just treat and within a week, the problem will be gone. 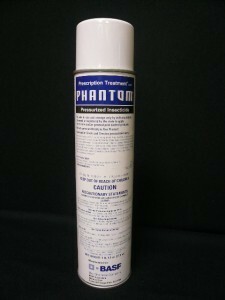 To use Phantom, you’ll want to first lightly mist it over the floor matts and carpet. This should take a few seconds per compartment so it won’t take much material to treat. Second, use the included injecting tube/straw to direct some into seats, door frames and basically any crack or crevice you suspect they might be using or potentially could use. The whole treatment should take 5-10 minutes to do and once done, let the car sit with the doors open for 20 minutes to effectively dry. After that, go back to using it like normal and expect to find dead bugs in the coming week or you might not see any again.